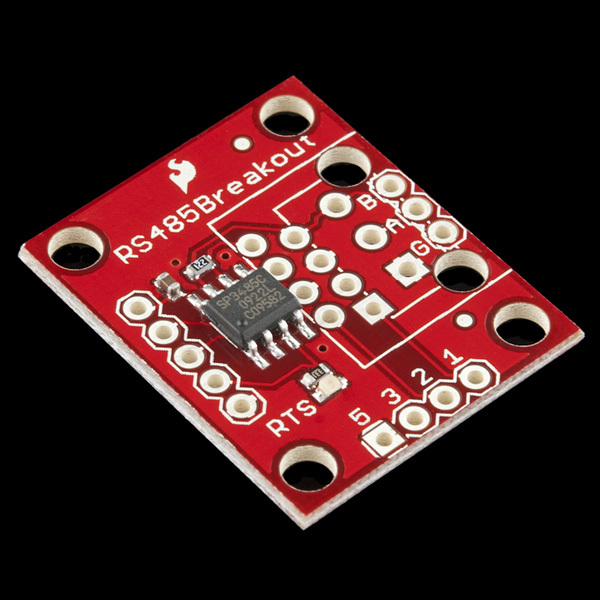 The SparkFun Transceiver Breakout - RS-485 ships configured so that are in receive only mode until you pull the RTS pin high. When RTS is high, they go into transmit mode and will return to receive mode once RTS is low again. While in transmit mode, the board will not be able to receive any data from the RS-485 bus. Try looking at this article to for a general connection using the RS485 protocol [ https://arduino-info.wikispaces.com/RS485-Modules ] and some Arduino Example code [ https://arduino-info.wikispaces.com/SoftwareSerialRS485Example ]. The schematic says that there is a 220 Ohm termination resistance between A and B. But when I look at the picture of the board it shows that there is actually a 1.2 kOhm resistor present. Is there any specific reason for this? As normally for RS485 a 120 Ohm termination resistance is used? Not sure about the one in the picture, but the build list for this board has a 220 ohm resistor in it and no 1.2K resistors. Rest assured the product we actually ship has a 220 ohm resistor. I have just bought this board and although it does what is says it uses 20mA? I have the board connected to a 3.3V regulated power source as well as the RST line to hard wire to transmit mode. This appears to draw 20mA? Is that what counts as low power or I am I doing something stupid here? The bus has a 200 ohm termination resistor so at 3.3v it will draw 16mA, so that seems about right. That's not the driver's fault. I have two of these wired up to UARTs 4 & 5 on a Beaglebone Black. The UARTs are properly (and tested!) muxed in the overlay. So I have TXD, RXD and RTS connected to the equivalent pins on the BOB-10124's (TX-O, RX-I and RTS pins) along with the requisite +3.3V and GND. The BOB-10124's are connected with about a foot of CAT5 cable, A-A, B-B and GND to GND. My application code is pretty simple. However, I cannot get it to transfer anything (or at least the receiving module (UART4) doesn't receive anything). I do see the RTS LED go on, then off after a brief pause, so it looks like it's sending. I know the pins and UART config is correct because if I just cross the UART pins directly it works fine. I've tried many combinations, enabling RTS/CTS in the ioctl(TCSETS) initial set up ... so far nothing has worked. Figured it out ... The UART TXD should actually go to RX-I and UART RXD to TX-O. Seems odd that this should be the case, but now that comment somewhere below about the TX-O/RX-I pins being swapped on the SP3485 makes sense ... Hope this helps someone. Could you share your design? I am interested in a breakout board for the max13487 and the changes you made. I am interested in the new board design using the Max13487. Will Sparkfun be carrying these soon? If not does anyone know where I can find one or find the design and parts? 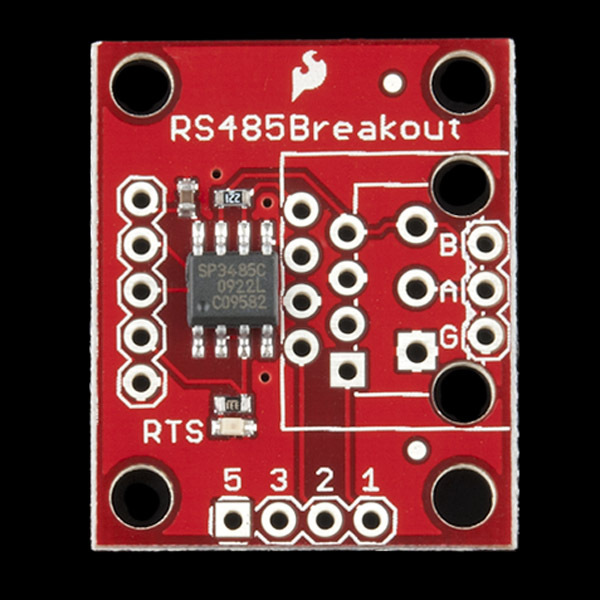 I've been messing around with the 485 breakout board now for about a month and it is extremely difficult to get reliable fast communication. At best so far I'm only able to get communication speed to about 1/3 as fast as it should be and I still have some errors. When I use a USB to 485 it works flawlessly, except I don't want to use USB for the finished product. So, I'm new to RJ485 and, if I use this board, I will be using this board for all the nodes in my little network so I don't care if it is compatible with other boards and I don't care if it is full-duplex. What I need to understand is how to connect them all together and communicate. There is a Network Topology diagram at the bottom of this page that makes it look like it is as simple as connecting all the R's and S's on a sort of 2-wire bus with a couple of resistors at the ends. The wikipedia page for RS-485 describes several different topologies. Master-Slave would suit my project the best (but isn't an absolute requirement), but then I read on this other page that master-slave requires 4 wires and full-duplex. Regarding communication, is it just as simple as connecting them to the TX/RX of the UART on my Raspberry Pi and Arduino boards? What about voltage translation between 3.3v and 5v devices? I know they boards can handle both but will the network of them handle a mix of voltages coming from the devices? So, can anyone help me sort this out. I don't want to buy the boards until I at least have a basic understanding of how to use them. Messing around with RS-485 a couple years ago, the TI Design Guide helped me the most to figure things out. RTFM! I admit it was me being stupid, but it doesn't help that they've named the pins differently from the chip. I really didn't expect the breakout labeled "TX-O" to be connected to "Pin 1 â RO â Receiver Output". The SP3485 specifies the Vcc to be 3.3 V. Is it allowed to operate this component with a Vcc of 3.0 V.? There is no indication whether this is allowed or not. I got a few of these for prototyping a home automation project, connecting a bunch of stuff over CAT-5 and RS-485. I notice that the blue pair (4&5) are connected to ground in the schematic of the breakout board, but PoE (on wikipedia anyway) says the blue pair are DC+ and the brown pair DC-. Is the breakout board wired for a different standard, and if so, which one? or something similar. is there a better solution? can someone tell me where can I find this in the Sparkfun Eagle libraries ??? I've been using this breakout for about a year now and it's been working pretty well. I've noticed from the beginning, that I need to have a delay of about 25 ms after I send serial data before I can bring the RTS line low otherwise the transmission gets corrupted or is not transmitted. This hasn't been a big issue yet, but for a recent project I am running two 485 lines from one Arduino Mega 2560. I am receiving commands on one 485 line from the host software and transmitting them if the address is correct (I have several Megas running). I am expecting a response on the second 485 line from the devices I am sending commands to. The issue is that the peripheral devices respond in ~20ms and sometimes I get it and sometimes I don't (based on the state of the RTS pin). I need to transmit these responses back to the host software. I feel like I should need these delays in the program. I would assume that the arduino has completed the transmission before it moves on from a serial.write() command. Any ideas? This is an interesting issue when designing half-duplex systems: when you're done transmitting you need to quickly switch to receive, but because the UART buffers at least one character (it will return to your code when it starts, not finishes, sending the last character), how do you know when you're actually done transmitting? I don't know exactly how the Arduino Serial driver works, but it might be worth digging into the source code (yay open source!) to determine if and how it is buffering characters before sending them. You might also look at the 2560 datasheet, as there is likely a UART status bit that is asserted when the UART is busy transmitting, which is something you could busy-wait on to deassert RTS immediately after the last bit is sent. With the above knowledge, you might be able to tighten things up in your code, or even hack on the Serial driver to automatically assert RTS while you're sending data and deassert it when you're done. Arduino is great at making the easy stuff easy. Here you're pushing it into something new, which may take a bit of work, but the nice thing about open source is that they give you the freedom to do so. Good luck and let the world know your solution to make it easier for the next person who wants to do this! Will this help? http://pydoc.org/2.5.1/termios.html "tcdrain(...) tcdrain(fd) -> None Wait until all output written to file descriptor fd has been transmitted." am trying to connect Sparkfun RS485 breakout to Xbee Pro modem. 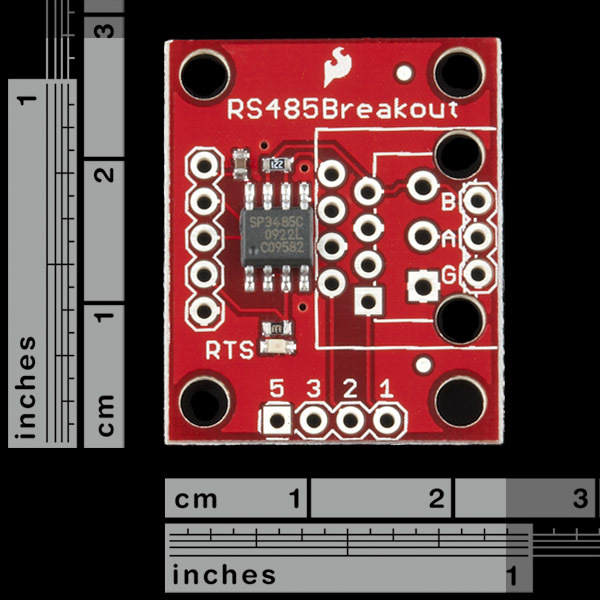 Since the RS485 breakout uses the SP3485 RS-485 transceiver IC which has its RTS pin to control the data flow I assumed that this signal should be obtained from the Xbee RTS (DIO6), or CTS (DIO7). Although both IOs where configured as RTS and CTS respectively, they fail to show any change in their status when data sent (from PC) or received from another Xbee..
Has any one tried this type of connection ? and can offer advise with tat regard. The issue you're running into is that RS-485 is half-duplex (it can transmit or receive, but not at the same time), while the XBee is full-duplex (separate transmit and receive lines). What you'd need to implement this is a signal that indicates when you're transmitting and when you're receiving. Unfortunately RTS and CTS don't provide this signal. They're for flow control, which allows the two sides to tell each other if their buffers are full and data transfer should pause to avoid losing data. I don't know of a signal on an XBee that could be used for this. You might be able to approximate this signal from your host system, but you'd need to be sure to switch to receive immediately after sending your data to avoid losing any of the reply, AND you'd have to reliably get this signal to both ends of the RS485 bus, which kind of defeats the point. I can think of two ways around this problem. One is to use a total of four RS485 boards, two for the TX and two for the RX signal, with the direction control permanently on. This would give you a four-wire connection with all the benefits of RS485. Another option is to use RS422 instead of RS485; RS422 is the full-duplex version of RS485 (there is no direction control). SFE doesn't currently carry any RS422 hardware, but the chips are out there and very easy to use. Anyone have any other ideas? I hope this helps, good luck with your project! Stray solder balls? Sure I can clean them up with my soldering iron, but for this price we should get some sort of quality control. Has anyone had any luck using this with an arduino? I'm trying to drive a dmx light using the tinker.it DmxSimple library. How do I know what uart baud rate to use when connecting to the tranceiver. The rs485 side is connected to a "black box"
This board doesn't care what baud rate you use, it just passes the signal straight through. But if you don't know what baud rate your black box is using, you'll likely have to try all the standard values to see if it responds to any commands. I know this might be stupid, but is there an easy way to connect this to a usb to rs232 converter on the UART side? If you ultimately want it to end up in a USB port, an FTDI Basic Breakout would be an easy way to do so. I considered using this breakout for my projects but the lack of full duplex capabilities had me looking elsewhere. I settled on the max488. A breakout of that chip would be very awesome. Of course the downside is that the max 488 is limited to 250 Kbps but I only needed it for serial translation from ucontroller to ucontroller. Why does one need a breakout board for a part which is available in thru-hole packaging? to monitor the 485 bus while transmitting (for collision detection), would it work to separate pin 2,3 on the sp3485 and then ground pin 2? That would still leave transmitter control on the RTS, but would it then receive while it was sending? There should be an assembled picture of this. In my haste to order I didn't realize the break-out was either RJ-45 -OR- 3.5mm screw terminal. The verbiage states "and" not "or". Upon receiving it, I realized that the side-pins are the standard .1" header pins mentioned, not for the screw terminal which only mounts if you do not mount the RJ-45 connector. It's my fault for not doing enough looking at the schematic/eagle board layout/PCB picture, but a simple picture of the completed PCB would have helped. In addition to my previous comments, I have found another flaw. There are no provisions for pull-up/pull-down resistors. The A/B RS-485 lines don't make their way to the breadboard so you can't put pull-up/pull-down resistors on easily. Also, why a 220 ohm terminating resistor? If you're using Cat-5 isn't the impedance of the twisted pair typically 120 ohm? Assuming you use one board at each end, the two 220 ohm parallel to 110 ohm, and you're correctly terminated. I bought this module a while ago and i was trying to make a simple application using a capacitive keyboard that sends data using RS485 protocol and my new Arduino Mega. The thing that is going on is that i am able to send messages to my keyboard from my arduino, but not in the other way... the arduino code get stucked in the line where the serial is supposed to receiva data. It is possible that the receiver module of the SP3485 chip is not working properly? or what else could it be? I could use this in my next DMX-512 design. Any chance for a full duplex transceiver? Possible even a breakout with optical isolation, protection circuitry, and a DC to DC converter for isolated power? i noticed that full duplex could be possible by connecting a second board's A and B pins to the pins 1, 2, 3, or 5 of the first board when using a RJ-45 connector. Add me to the list as well. I'd love to see a SparkFun DMX-512 board. Although it is reasonably priced and possessed of a clever variety of plated holes for the attachment of various connectors, if I had done my homework I would not have purchased this board. Why? Because the obscure SP3485 chip that it uses does not have automatic flow control and is therefore not compatible with many popular open source libraries for RS485 and in particular Modbus RTU. Unfortunately there don't seem to be a lot of other choices except certain parts in online auctions and building one's own board with MAX488, MAX13487E or another flow-control transceiver. So this board delivers what it promises, but what it promises is a clever implementation of a chip that no one else uses for quite good reasons. Not recommended. You are looking at a PDF of the Eagle schematic. It is not incomplete, it simply makes use of hidden connections that are managed within Eagle. The easiest way to view the traces is in Eagle. We post the PDF and the Eagle files so that the end user has the option to view as either. However, for best experience, using Eagle to view the schematic allows quicker and simpler navigation through the wiring. Worked fine in my application. I needed to replace the C grade part with an E grade part for wider temperature range. The C grade part will be fine for most applications. It was nice to be able to simply swap out the part.